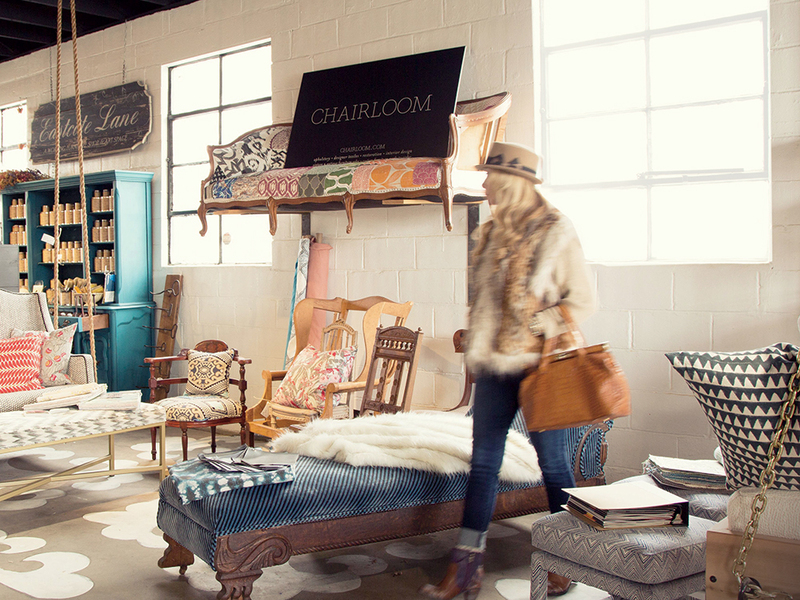 Chairloom joins a host of other high-end names in fashion, home décor, and vintage pieces at Kennett Square’s new one-stop shop, Works. 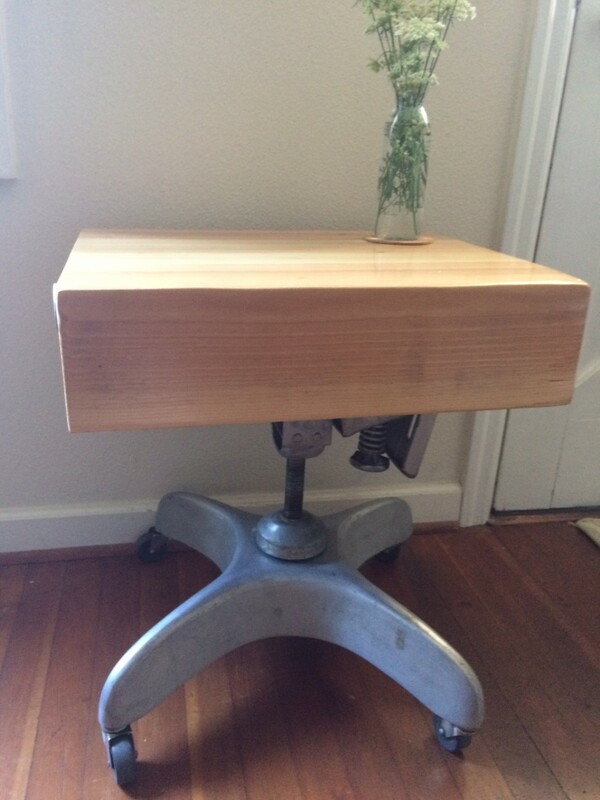 A very sweet rolling table for sale. Cast aluminum base, adjustable height (2 ft at the tallest), 16″ x 22″ top. 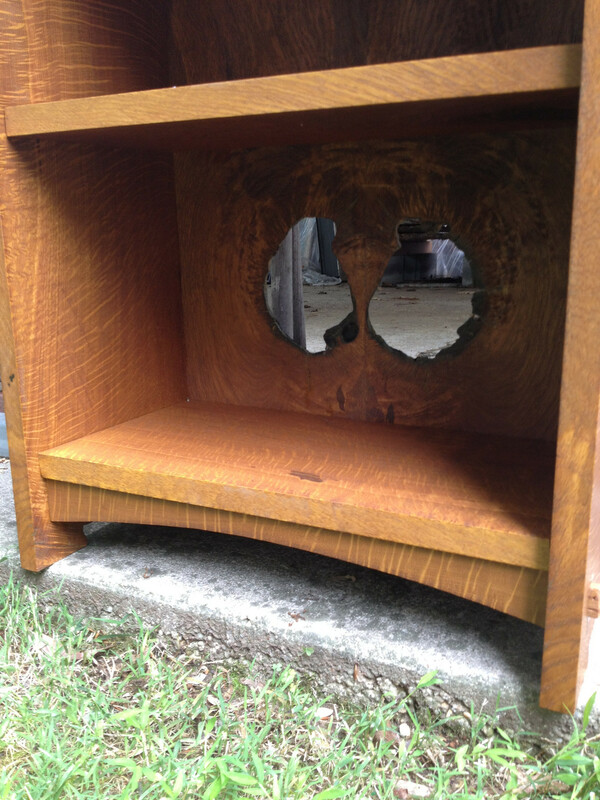 This is a mix of glue-lam top with a 1960’s drafting chair bottom. The handle is the chair’s adjustment knob. $300. Contact reclamationnews @ gmail for more information. From afar, the pieces appear to be stylish and modern versions of standard-issue living room furniture. But, upon closer examination, the upholstery covering the chairs is recognizable as patchworked panels from vintage black leather motorcycle jackets. 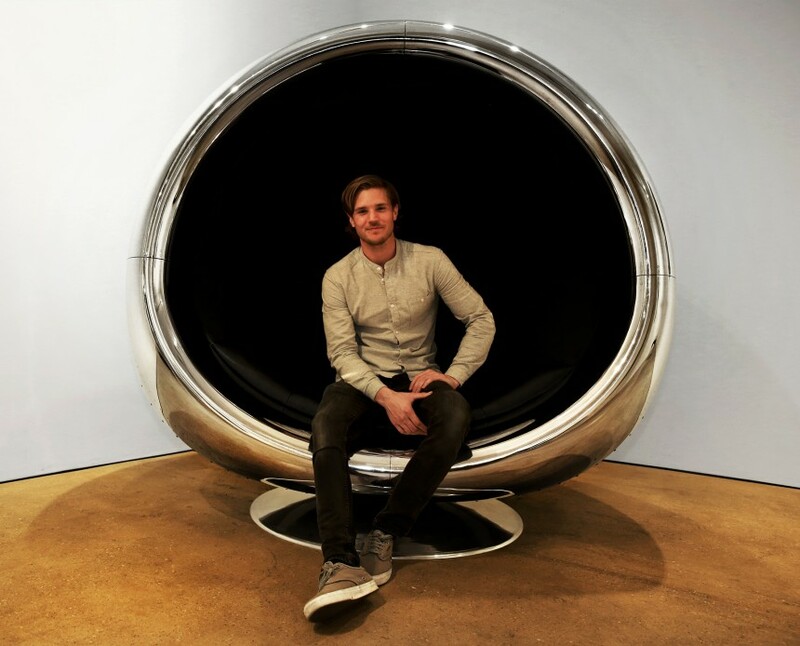 And, while you’d have absolutely no way of knowing it, the eight cushions covering the polished black nickel sofa frame began life as an armload of sweatshirts and tent canvas before being washed, dyed, combed and waxed into a second career, and that some of the frame’s supporting straps are repurposed straps from military parachutes. 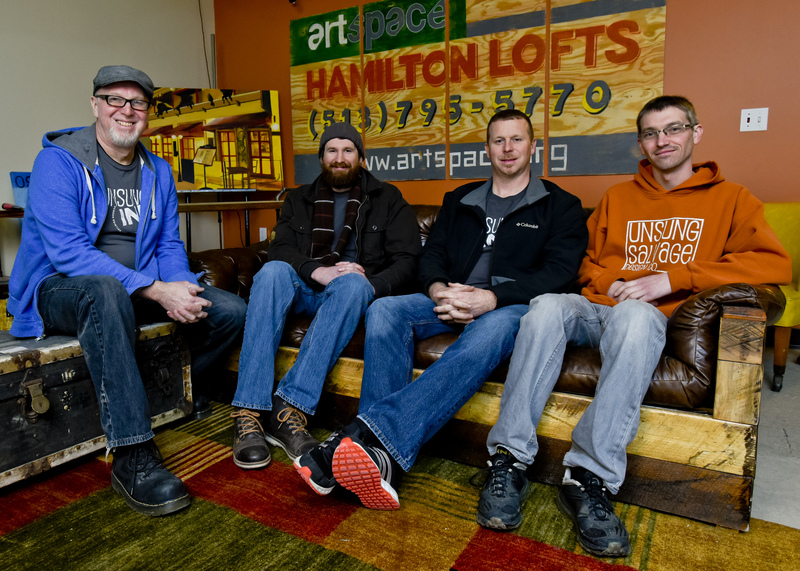 “We like to take pieces from a client that maybe were discarded … and repurpose them into something else,” he said, offering as an example a crib used by three generations of a Hamilton family and repurposed by the business as a bench to be used at the foot of the client’s grandmother’s bed. 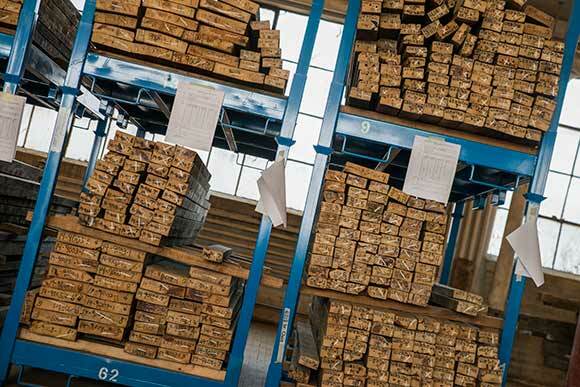 The latest salvage wood designs – particularly by Canadian exhibitors – amplify rugged wood finishes by juxtaposing them with materials such as glass and metal. 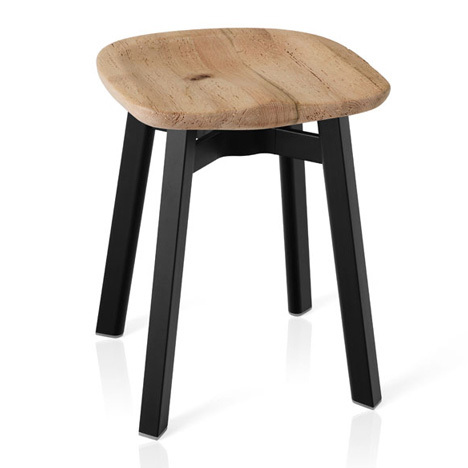 Local studio Fuel Glassworks’ Floe end tables, for example, feature a blackened wood beam with a polished-glass top, while Honing Design’s Hagensborg Bench is made of reclaimed red cedar accented with stainless steel. 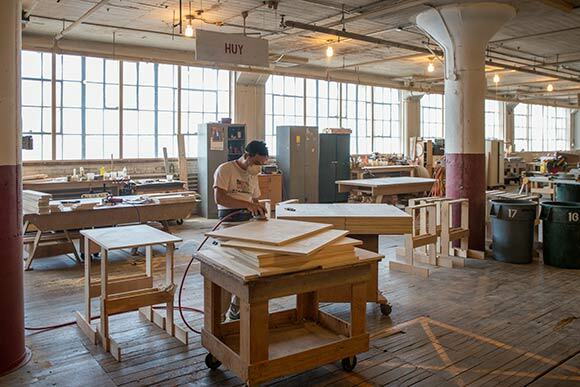 The company 1925 Workbench, meanwhile, is showing reclaimed barn-board sliding doors with hardware made by hand in the designer’s studio. 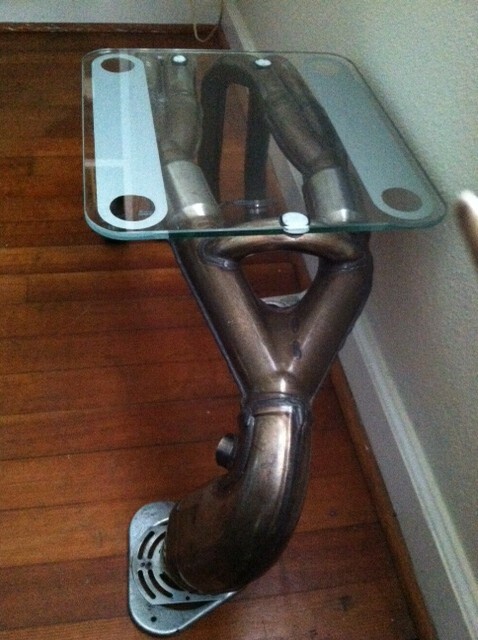 This is table is actually the exhaust system from a defunct 2005 Honda CBR 600RR. The glass top is from a salvaged bathroom scale. 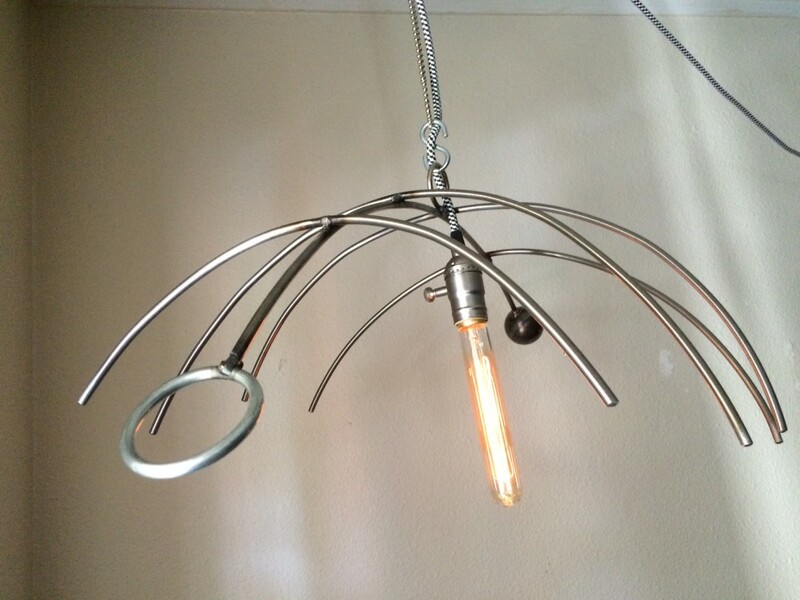 The front foot is two found metal pieces welded together to keep it balanced. Sorry for the poor (potato) quality photos. The vivid colors and patterns Murphy applies to the furniture reference the “unpolished potential” of her hometown Margate, a British seaside resort that had been popular in the 1950s as a tourist destination, but has since fallen in disrepair with many of the landmarks closed, burned down, or removed. 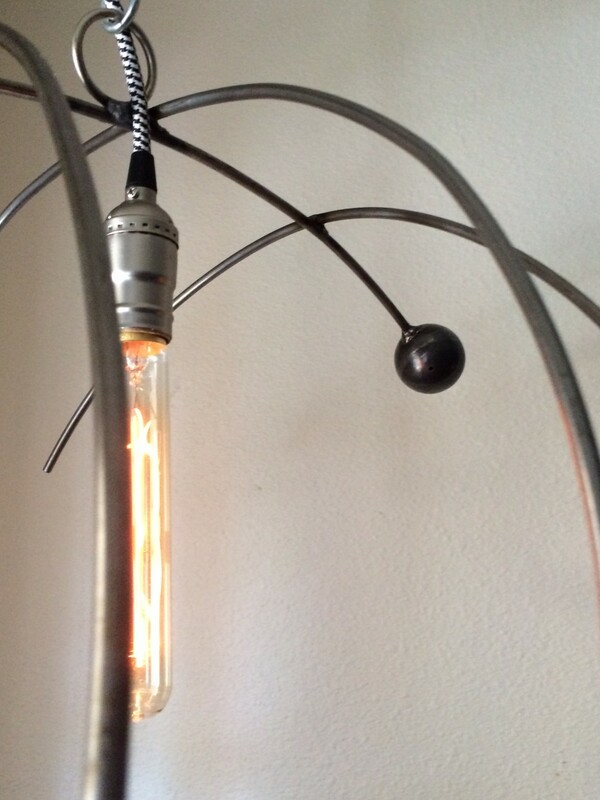 via Zoe Murphy revives unwanted furniture into gorgeous and whimsical pieces | Inhabitat – Sustainable Design Innovation, Eco Architecture, Green Building. 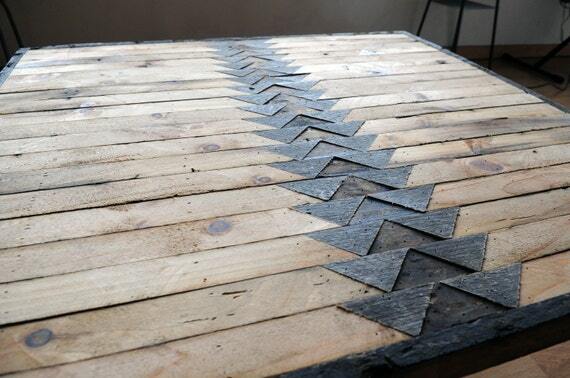 Reclaimed wood coffee table with a fun triangle pattern. I actually stole this triangle design from a cool pair of socks that I came across recently. There are three colors of wood in this piece, the lighter color was taken from the Interior of the board, the darker triangles directly in the center were taken from the exterior of the board, & the gray triangles were taken from gray weathered pine. 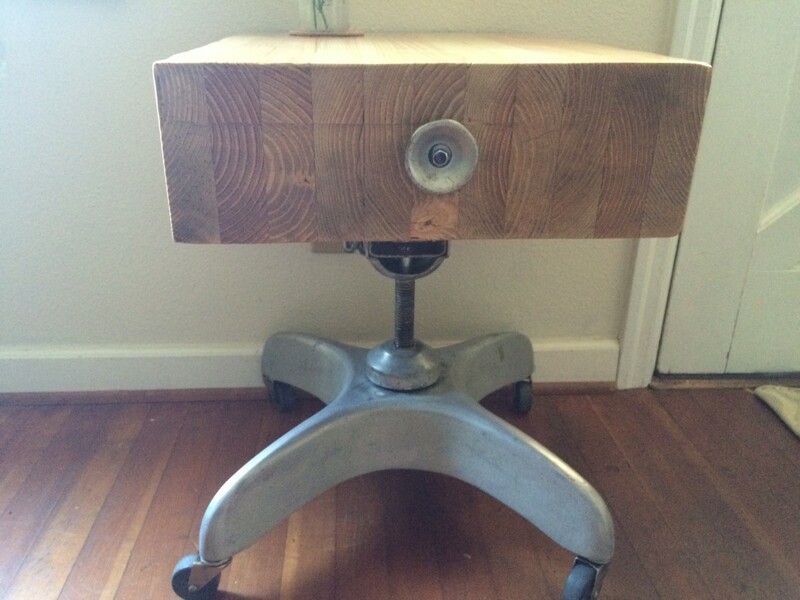 via Reclaimed wood coffee table by UniqueIndustry on Etsy. 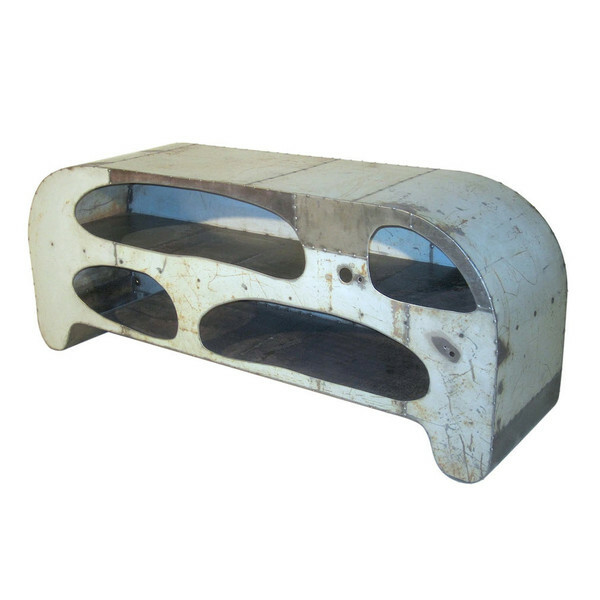 Style meets function in this one of a kind functional shelf set. Upcycled wood scraps were cut into random depths and widths then stained in various shades or left completely naked for an organic feel. 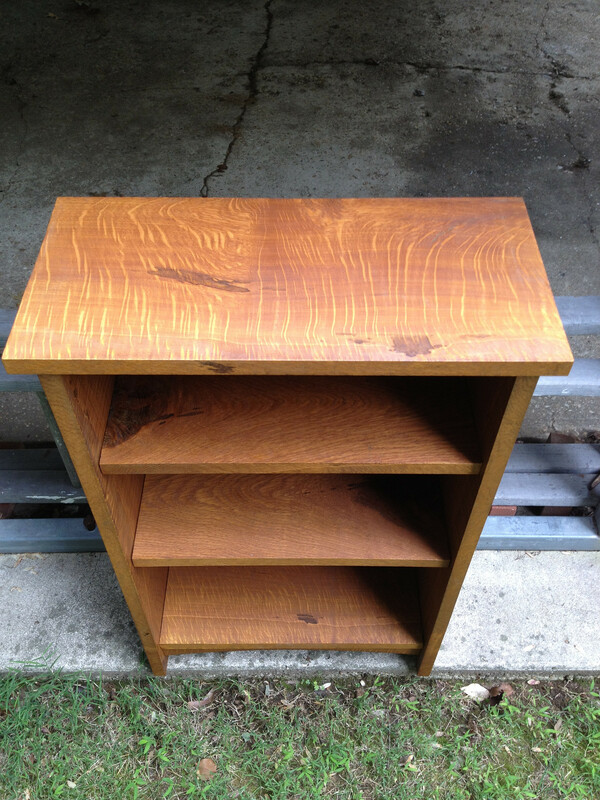 We have claimed these shelves for our own paint studio, and love the style and functionality they provide. 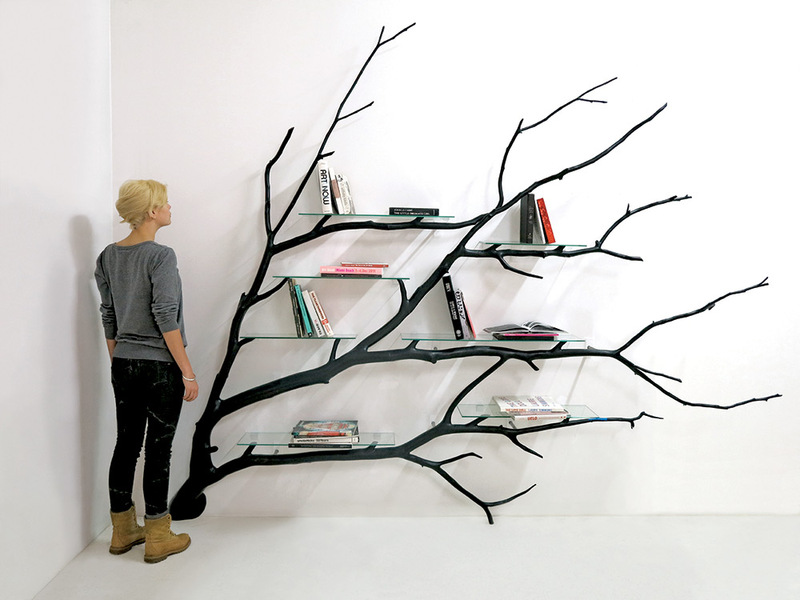 These shelves make an entire wall and are versatile with how they can be arranged and coordinated with other decorative elements. 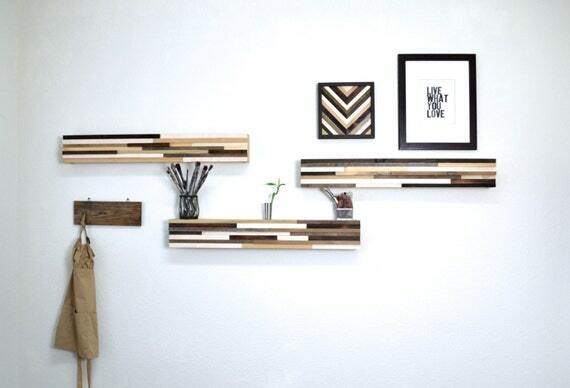 via Reclaimed Wood Wall Art Shelf Abstract Wood by moderntextures. 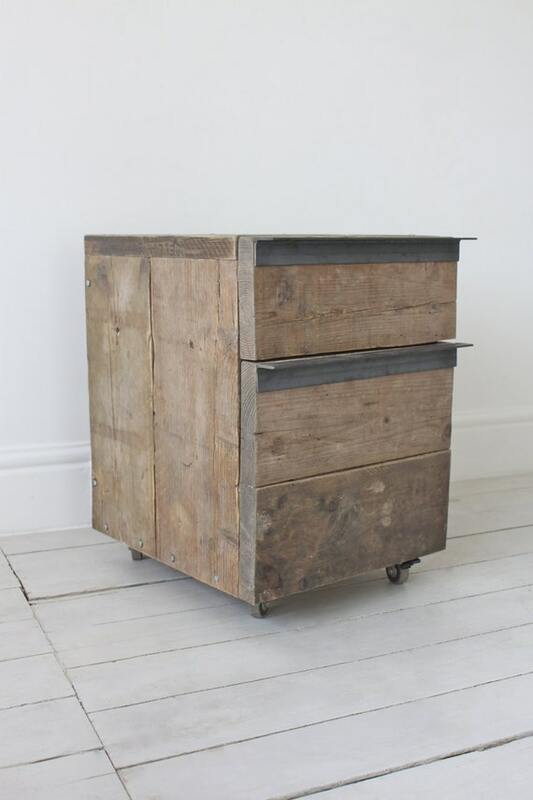 London showroom SCP proudly presented legendary designer Piet Hein Eek’s recycled wood sideboard. 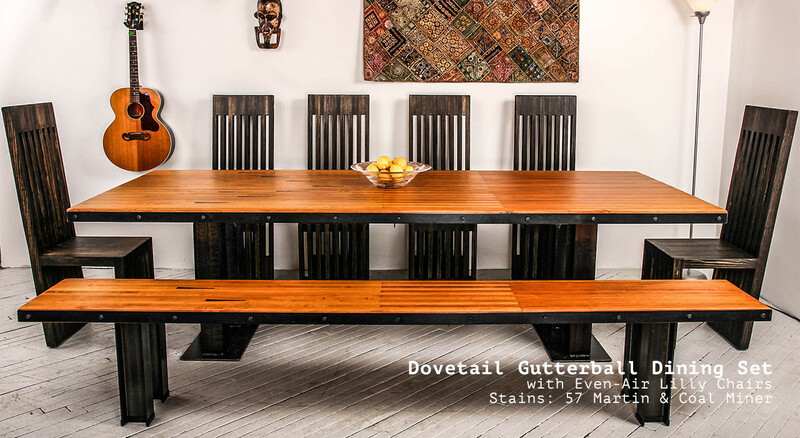 The Dutchman masterfully reworks reclaimed wood into beautiful and highly functional furniture. 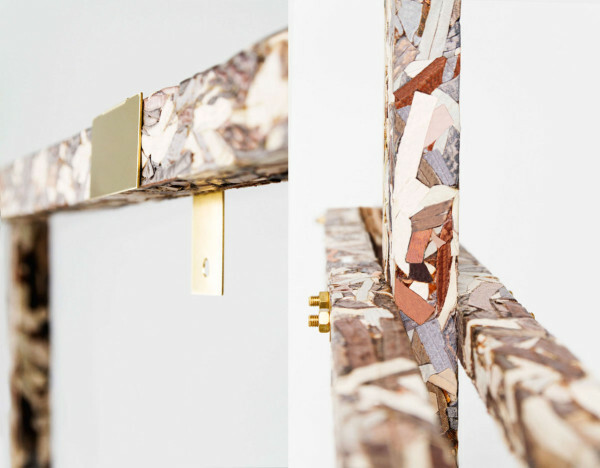 via 9 Inspiring green artists on show at Decorex from London Design Week 2015 Reclaimed wood sideboard by Piet Hein Eek – Inhabitat – Sustainable Design Innovation, Eco Architecture, Green Building. Using the Brazilian Ipe salvaged from the old Coney Island Boardwalk, my partner Patrick Delorey and I designed and built this low coffee table out of the hard wood. 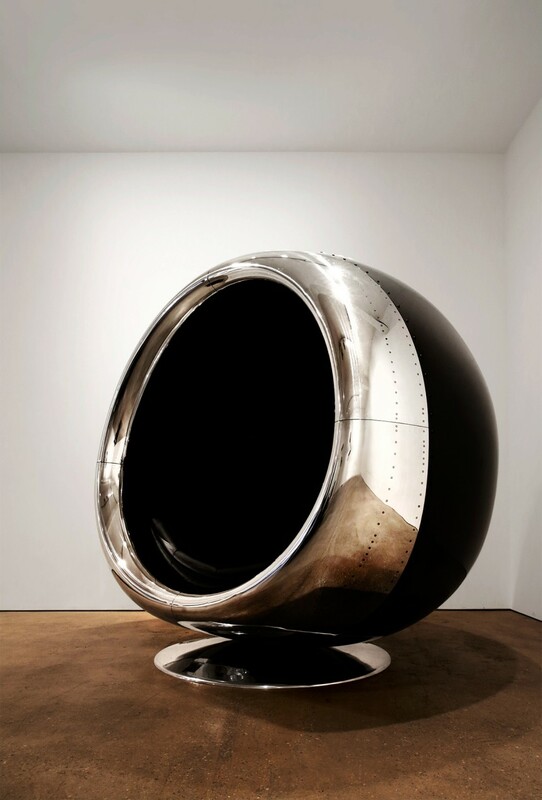 It’s an exploration of deformation, old and new, and a pragmatic form. 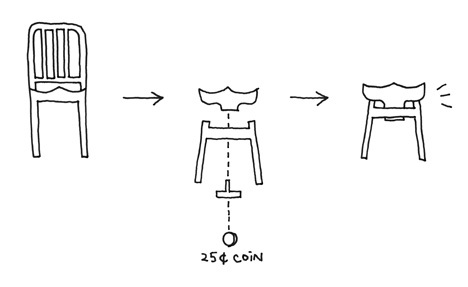 via Coney Island Low Table – The Design Brigade. via Farm-to-Table Furniture – Urban Gardens. 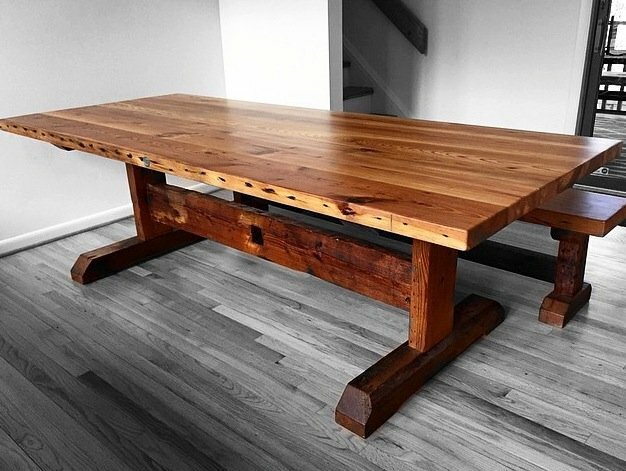 If you’re in the market for a dining table, you’re in luck, because there are so many talented woodworkers making beautiful handcrafted tables from salvaged or sustainable wood. via 7 Reclaimed & Handmade Wood Dining Table Makers You Should Know About | The Kitchn. 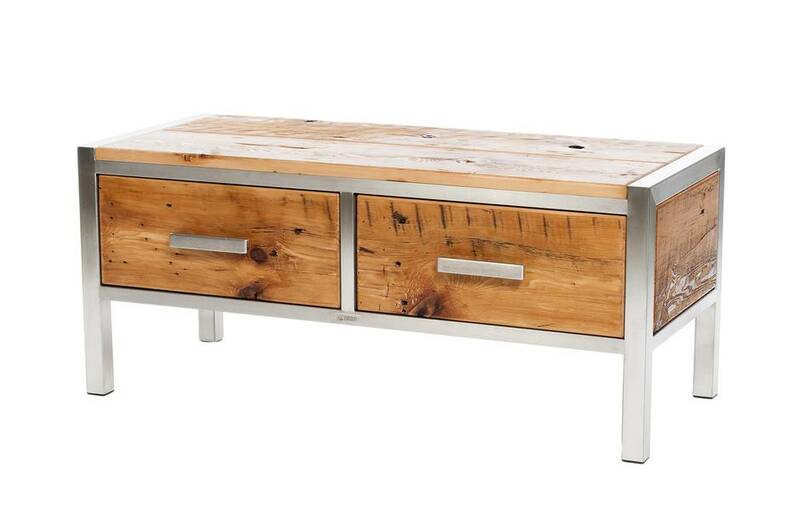 Reclaimed wood and cast metal – these materials have natural imperfections, which Fern & Roby believes is a benefit, not something to hide. 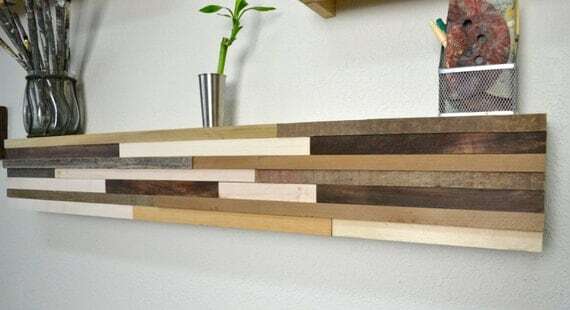 via Fern & Roby make high-end electronics out of reclaimed wood | Inhabitat – Sustainable Design Innovation, Eco Architecture, Green Building. 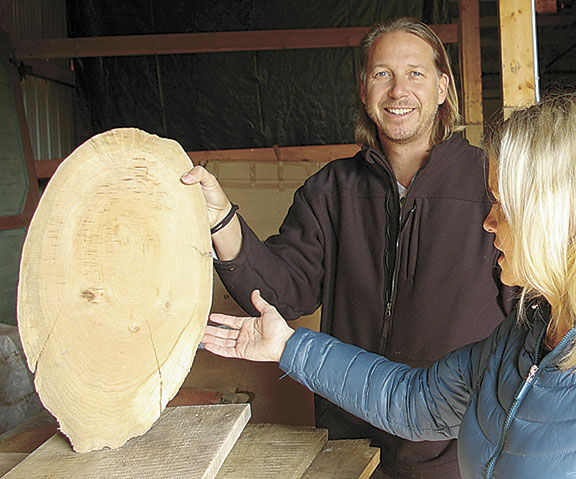 “It’s kind of a God thing — the wood seems to find me,” Urban Farmhouse co-owner Jason Thomas said. Over the course of two years, Urban Farmhouse owners Jason and Cherami Thomas have grown the business from the garage of their rented house into 60,000 square feet of showroom and manufacturing space on S Western Avenue. 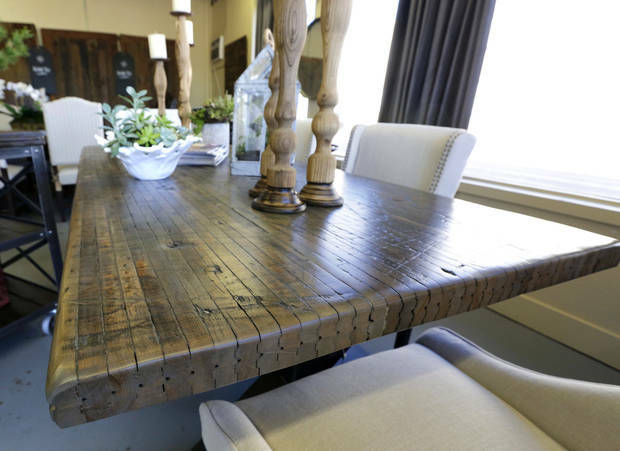 Customers drive from as far away as Texas and New Mexico to purchase rustic-looking tables and chairs Urban Farmhouse has made from reclaimed wood. via Urban Farmhouse Designs has grown by creating popular furniture pieces from reclaimed wood | News OK.
a series of collected pine logs are turned into seating objects – without losing the characteristics of their natural form. 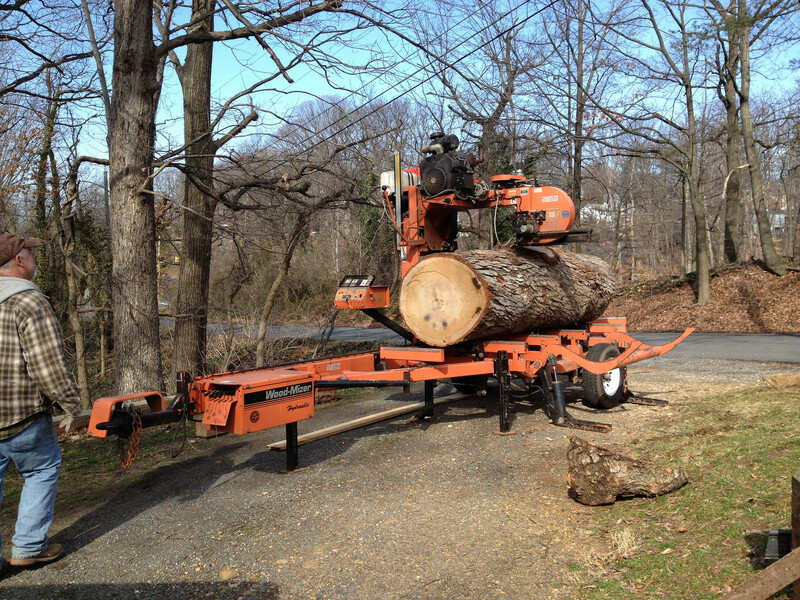 via hand crafted reclaimed log furniture. 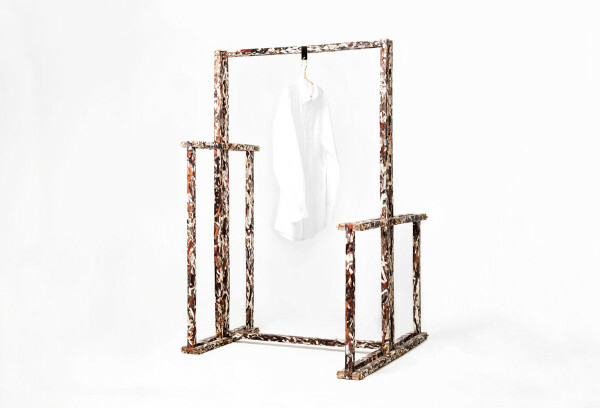 Structural Skin is a capsule collection created from this new material that is made completely of discarded leather waste, including any binder or resin used during production. 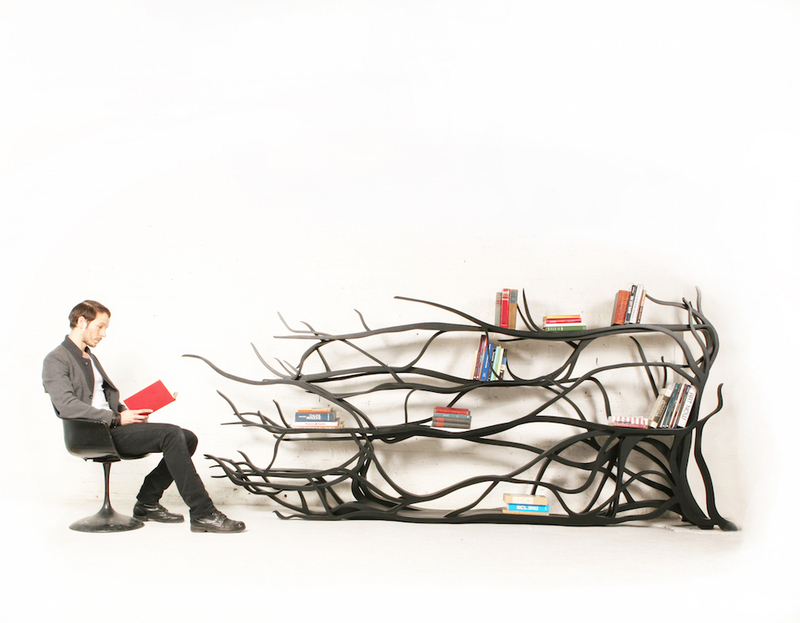 via Discarded Leather Becomes Furniture – Design Milk. 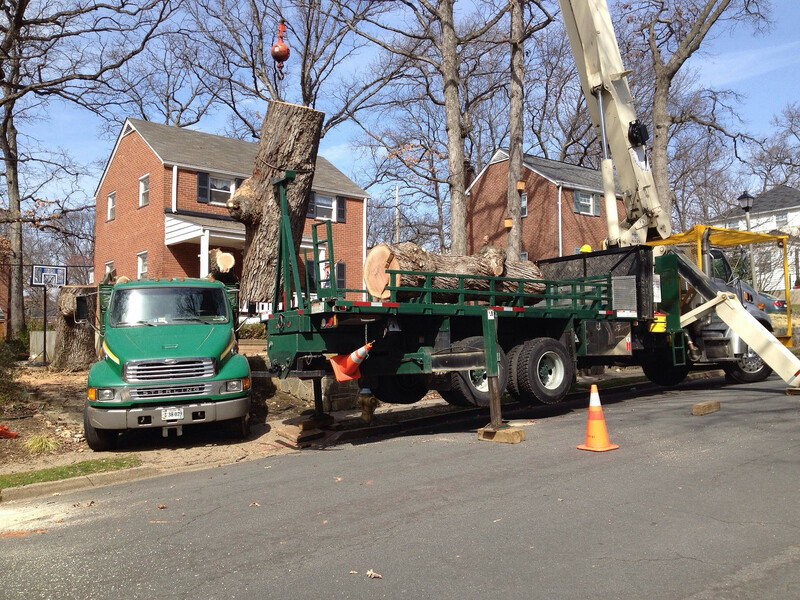 Neighbors Tree to Evan’s Bookcase – Brendan M.
Brendan M. salvaged part of his neighbor’s 100 year old white oak tree scheduled for removal. 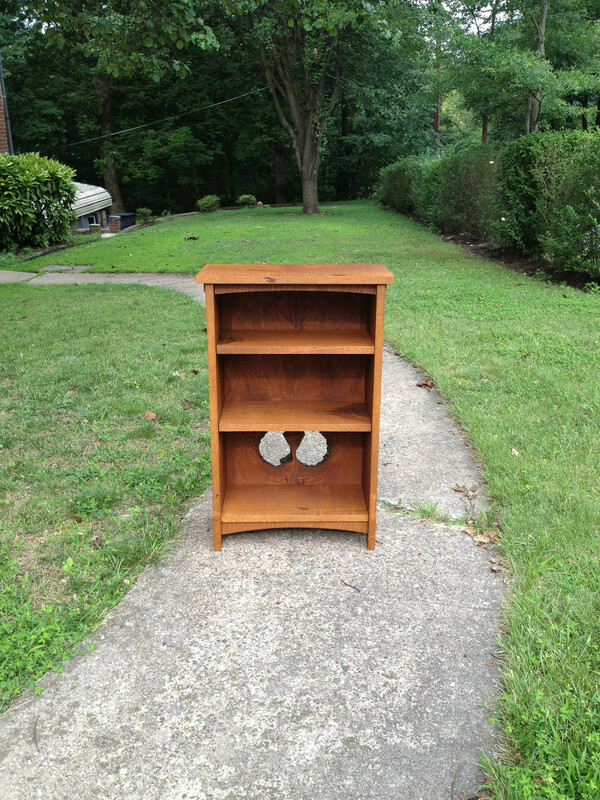 He transformed it into this beautiful bookcase. The designers at FOCUSED have been teaming up with skate shops and factories all throughout Europe to collect old skateboards, and give them new life as beautifully crafted tables. 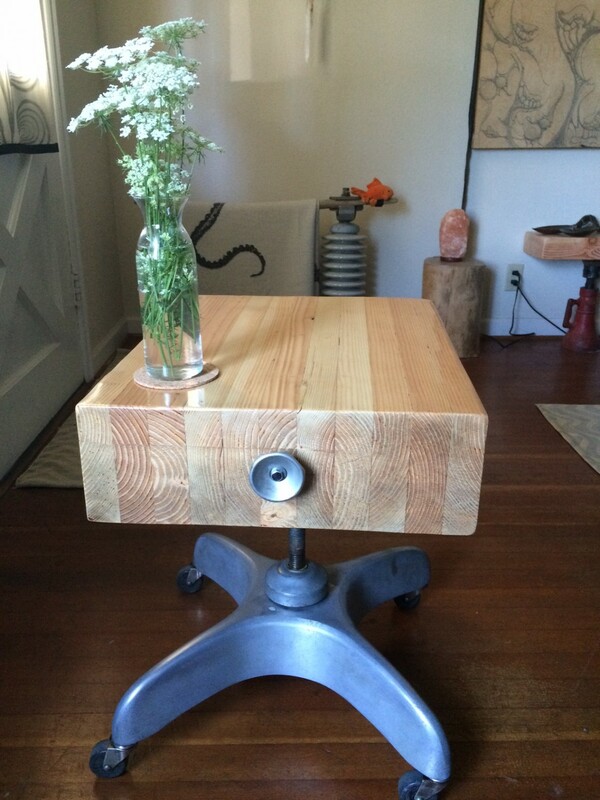 via DecksTop Recycled Skateboard Table | HiConsumption. 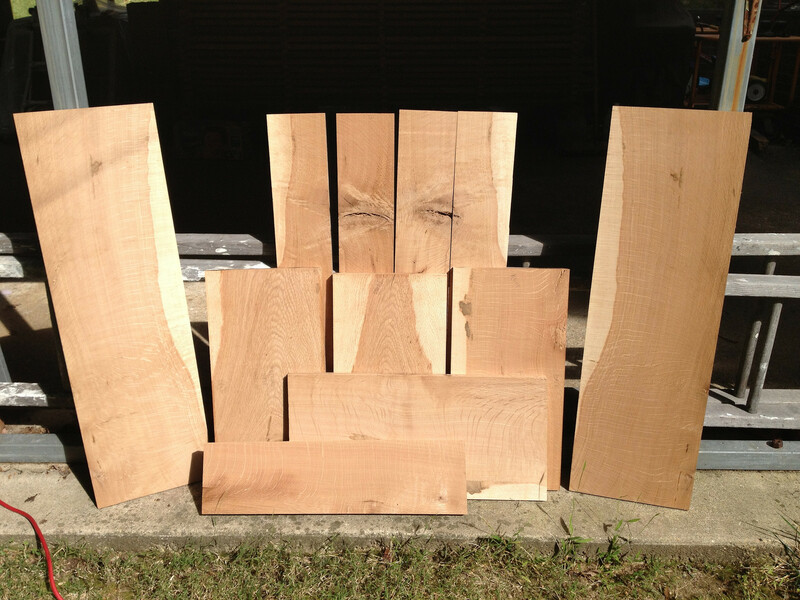 The partners are strong believers in using sustainable materials for environmental reasons, but they also find value in the history and the story reclaimed wood gives a project. via Reclaimed wood company Grain Designs building on success of NDSU memorabilia | West Fargo Pioneer. The reclaimed scaffolding boards which we use for the majority of our commissions are super quirky and no two are ever the same… they have had a colourful life on building sites and often display some of the following “imperfections”… we think these are actually “perfections” though, and the reason the boards have so much character and appeal! 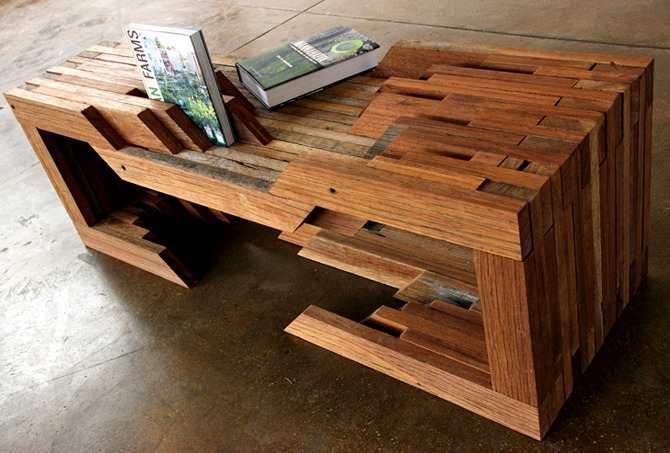 via Aesthetics of Reclaimed Boards – Inspirit. 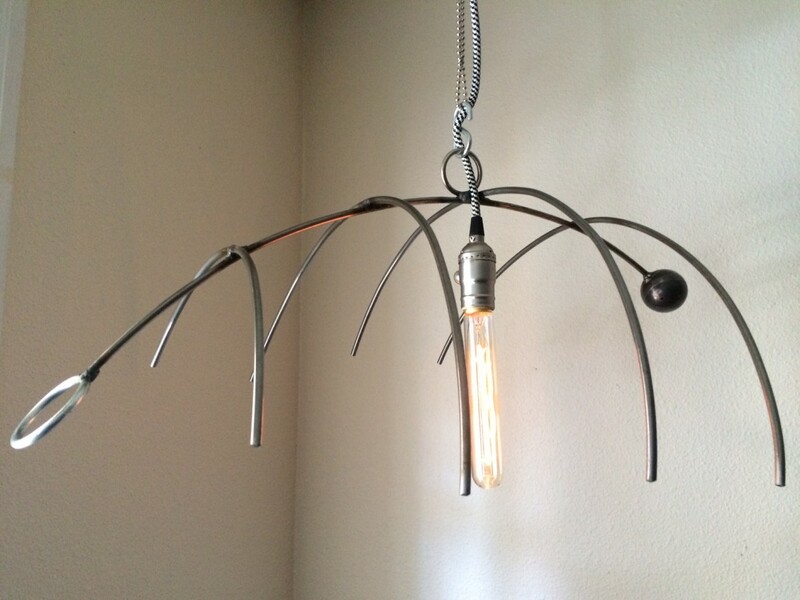 The frame of the artpieces is a historical deep-sea mine of AGSB-type, made in Russia in 1942. It was a big galvanic deep-sea mine, equipped with “Blok” device and two contact electro-magnetic antennas. The upper antenna was kept steady by a buoy. The mine was used to fight submarines. It was still manufactured in the 50-ies. The author and designer of the Marinemine furniture is Mati Karmin, whose career is characterised by an intense and remarkably versatile activity. Furniture maker Greg Klassen builds intricately designed tables and other objects embedded with glass rivers and lakes. Inspired by his surroundings in the Pacific Northwest, Klassen works with edge pieces from discarded trees (often acquired from construction sites, or from dying trees that have begun to rot) which he aligns to mimic the jagged shores of various bodies of water. via Table Topography: Wood Furniture Embedded with Glass Rivers and Lakes by Greg Klassen | Colossal. We also partner with local conservationists who work with the city and other businesses to reclaim wood from old buildings and demolition sites in and around Southern California. 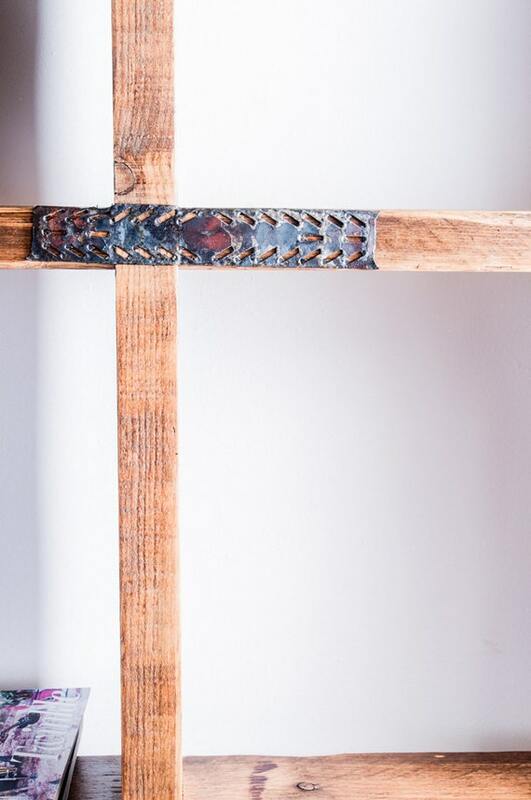 via Reclaimed Wood — Arbor Exchange. Recycled Brooklyn goes the whole nine yards with everything from benches made of wood planks salvaged from a film studio to tables created from salvaged bowling alley floor to padded benches covered in recycled coffee sacks. 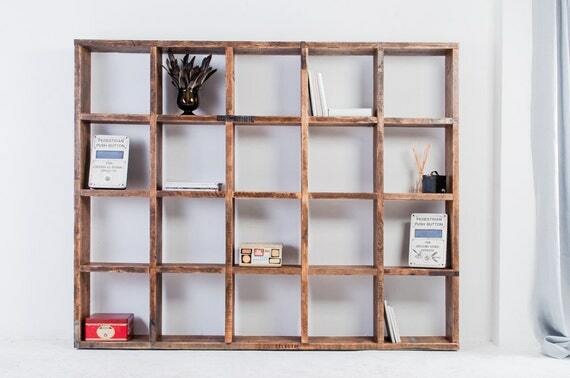 via Recycled Brooklyn Reclaimed Furniture | Cool Material. Interestingly enough Geiger has managed to capture Apple’s essence in his design, especially when you think about how Apple Stores are typically furnished using wood, glass, and metal. via Apple Power Mac G5 Computers Repurposed As Furniture | Ubergizmo. I’m not sure how I came up with the idea, but it probably happened while I was in wine country, tasting wine and I had a moment of inspiration while under the influence. In any case, I wanted to make something a little different than the normal chunky wine barrel furniture – something a little more graceful and contemporary. I’d never seen curved barrel staves turned on their side before, so I decided to start there. 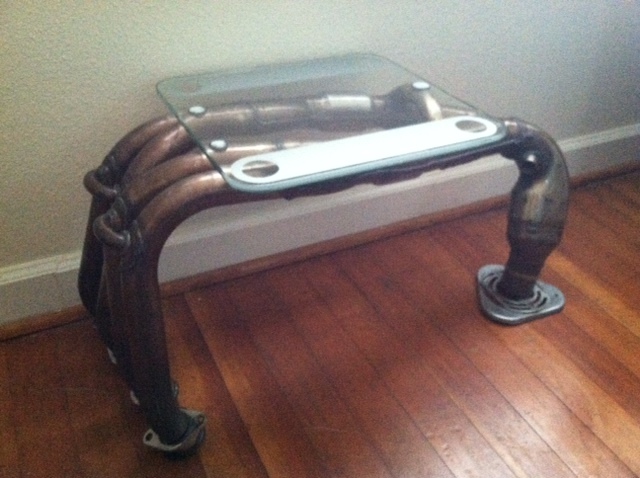 via Oak Wine Barrel Coffee Table. 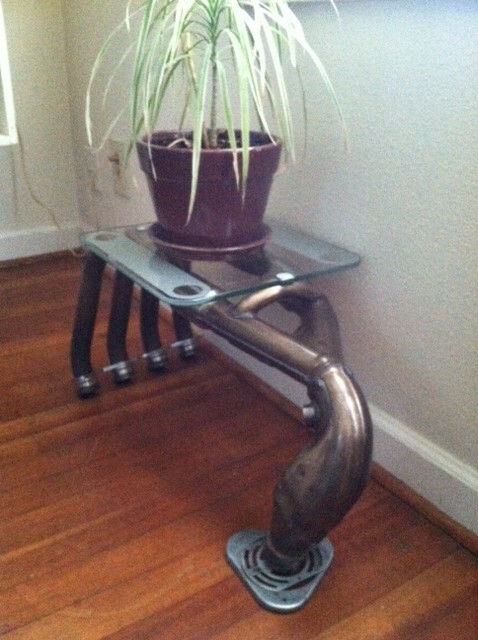 Michael Hensel created uncompromisingly industrial furniture from used escalator steps. 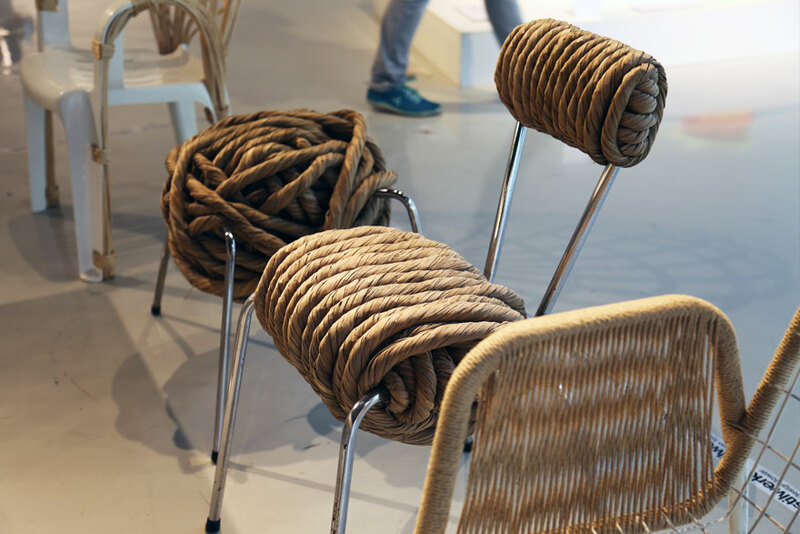 Third prize went to Laura Jungmann, Monika Nickel, Cornelius Reer and Matthias Blindow for their clever refurbishing reinterpretations of found objects such as chairs, tables and vessels. 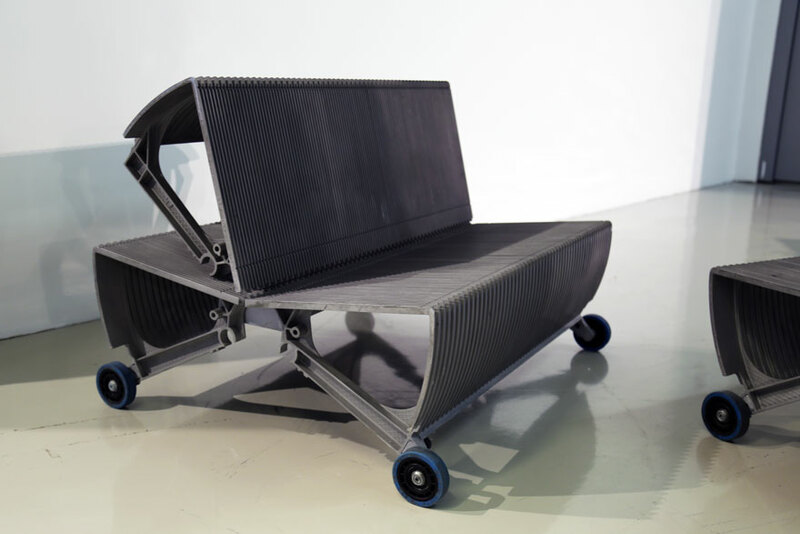 via Vienna Design Week 2014: Recycling Design Prize – Core77. Basing on the premise that historical building materials are of special value, spolia. makes a point of ’misappropriating’ valuable materials and setting them in a contemporary context. The result is a limited edition series of selected furniture and objects in which the historical structural elements take center stage: fine craftsmanship which has not only gained in value over time but carries history within it. 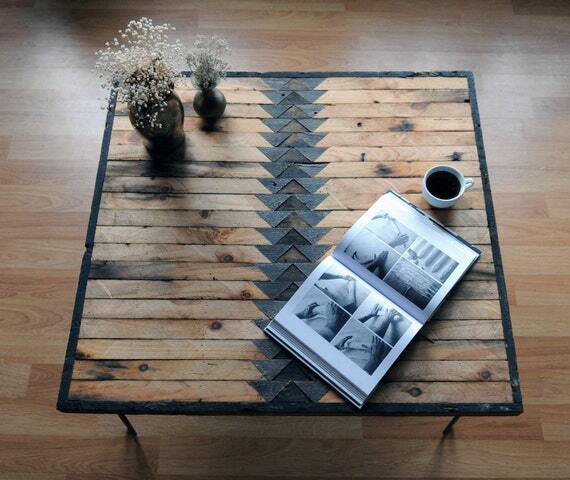 via Edition 02 by Tino Valentinitsch was made with parquet salvaged from a ca. 1850 Bolognese industrial villa | MOCO LOCO Submissions. modern furnitureoak parquet floorreuse designspolia.